Baytril Otic treats ear-based bacterial infections in dogs, and works effectively against several kinds of bacterial and fungal infections. Shake well before each use. Tilt head so that the affected ear is presented in an upward orientation. 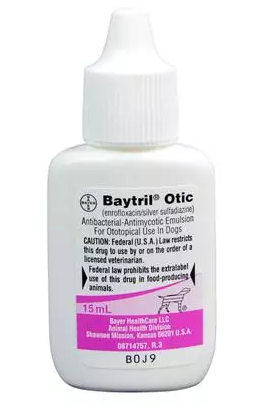 Administer 5-10 drops of Baytril Otic to coat the ear lesions and ear canal. Following treatment, gently massage the ear so as to ensure complete and uniform distribution of the medication throughout the external ear canal. Apply twice daily for a duration of up to 14 days.